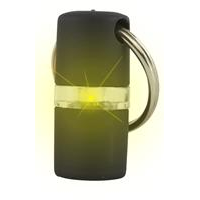 B Seen 360 Light Tag for Dogs - Black offers an innovation in safety for both dog and owner. The flashing tag lights up from all directions, restoring safety to owners and their dogs when walking at night, in particular during the darker winter months. This effective light tag can be seen from every angle regardless of the direction the lamp is facing. The B Seen 360 Light Tag for Dogs - Black is both waterproof and shock proof making it just as effective in the rain. This stylish product is simple to attach to the collar and can be removed just as easily. Poor quality didn't last one walk. 1 star is too high a rating don't buy! !